A sleek money clip for your favorite minimalist lady or gentleman. 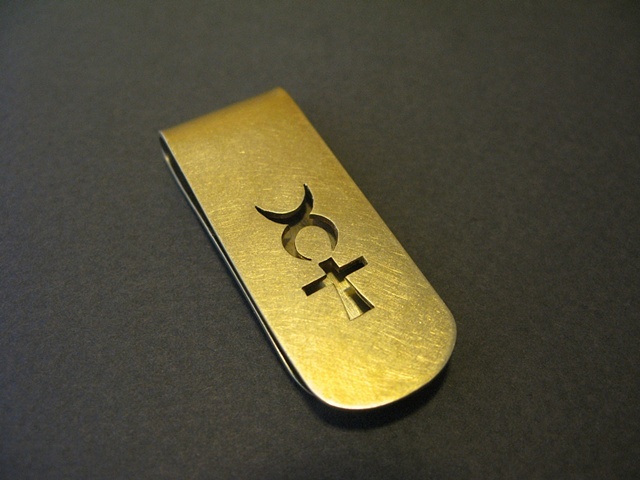 Hand-pierced with the symbol for Mercury, traditionally one of the three most important elements in alchemy (Sulfur and Salt are the other two). Mercury fascinated alchemists because it was both liquid and solid - duality embodied but also unified. Mercury was believed to be the material from which all metals originated. It is raw life force. It is the chaos before creation begins and after creation ends. 2" x 3/4" x 5/16"